The literal English translation of the Malayalam word Randaamoozham is “next in line”. Slightly extended, it might be used to describe someone who is perpetually second best, forever the bridesmaid, and this made it a particularly apt title for M T Vasudevan Nair’s acclaimed retelling of the Mahabharata in the voice of Bhima, the second of the five Pandava heroes. Next in the line of succession to his elder brother Yudhisthira (and usually in the shadow of his younger brother Arjuna when it comes to charisma and skill in warfare), Bhima comes across as a gluttonous, slightly oafish he-man figure – or a comic foil – in many mainstream renderings of the great epic. But Nair (popularly known as “MT”) turned him into a three-dimensional figure, more sensitive and thoughtful than he is usually given credit for. “He took familiar building blocks and created an entirely new, incredibly compelling construct from them,” says Prem Panicker, senior journalist, Rediff.com co-founder and a long-time admirer of MT’s work. When Panicker first read Randaamoozham as a youngster, it helped him realise that “the stories that made up the warp and weft of my ‘heritage’ are open to interpretation”. Returning to the book years later, he was struck by the nuances a familiar tale could yield if you changed the perspective even fractionally – “like a kaleidoscope, where every time you gently flick your wrist, strange and wonderful patterns emerge from the same broken bits of glass”. A little over a year ago, he embarked on a whimsical, experimental project that quietly grew into a robust literary work: an English transcreation of Randaamoozham, serialised under the title Bhimsen on his very popular blog Smoke Signals. The series is now complete – it runs to 72 episodes and 135,000 words – and available in PDF format on the website. It’s an outstanding work that deserves to be read by anyone interested in an intimate, earthy version of the Mahabharata – one that places us right amidst the characters. “Perspective tellings” of this complex, multi-layered epic are not, of course, new things. Many notable books and plays in this vein have been written in all the major Indian languages – Shivaji Sawant’s Mrityunjay (Marathi), Pratibha Ray’s Yajnaseni (Oriya) and P K Balakrishnan’s Ini Nhan Urangatte (Malayalam) being just three among them – but unfortunately for the English-language reader, hardly any of these are available in high-quality translation. This makes Panicker’s Bhimsen an especially important work, one that remains deeply respectful of the original Randaamoozham while at the same time confidently building on it. It isn’t a straight translation. Using the blog-post format meant that Panicker had to carefully work out how to begin and end each chapter, which is a different process from flowing a story over the uninterrupted length of a book; each episode had to be relatively self-contained. He also drew on his own understanding of the Keralite martial arts tradition to embellish the descriptions of Bhima’s many hand-to-hand combats. And he expanded on the frequent tensions between the Pandava brothers, for Randaamoozham, as he points out, is at its heart the story of a family struggling to survive. As a reader, if you come to Bhimsen having previously encountered only mainstream translations of the Mahabharata, there are two important things you have to deal with. First, this is not an omniscient-narrator telling: everything we read is filtered through the prism of Bhima’s personal experiences, his very particular biases and prejudices. This seems like an easy idea to process, but a reader who knows the Mahabharata well must keep reminding himself of it. It’s revealing to read the comments on Panicker’s original Bhimsen posts and note how frequently he got asked to add an extra sentence or two elaborating incidents that Bhima wouldn’t have had direct access to (“More details on the Abhimanyu killing please”) or justifying the behaviour of another character. A recurrent subject of such requests was Karna, who is presented here almost throughout as a negative figure, rather than the tragic anti-hero so many of us Mahabharata aficionados admire. 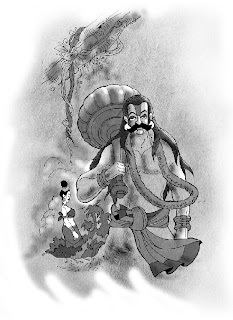 But as Panicker shows us, when we are looking exclusively through Bhima’s eyes, it’s perfectly natural to view Karna as nothing more than an arrogant, mean-spirited low-caste man constantly trying to rise above his station in life by ingratiating himself with Duryodhana; an outsider meddling in family affairs and adding to the trouble. Other perspective tellings will, of course, present completely different pictures, which add up to create a fascinating tapestry, for these subjective renderings go a long way towards helping us grasp character motivations and appreciating the many moral complexities of the story. The other thing to understand about Bhimsen is that there is no room in it for the supernatural or the divine; everything is explained in strictly realist terms. Thus, when the young Bhima is poisoned by Duryodhana, he doesn’t enter a magical snake kingdom at the bottom of the river and receive nectar that will grant him the strength of 8,000 elephants – instead he meets a tribe of Nagas, who heal and fortify him before sending him back home. Most of the “rakshasas”, such as Bhima’s wife Hidimbi and son Ghatotkacha, are similarly tribal-folk, people who exist on the fringes of the kingdoms that make up the narrative (and who are not particularly well-treated by the epic’s conventional heroes). Karna’s “Shakti”, the irresistible, one-use-only weapon supposedly gifted to him by Indra, is described with careful realism as an arrow that contains freshly extracted snake venom, therefore guaranteed to kill (and not replaceable because the warrior would have to carry a basket of live snakes around with him on his chariot!). There are references to the Pandavas being the sons of Gods, but in his brusquely pragmatic way Bhima de-mythologises himself and everyone else, dismissing the bards’ songs as fanciful public relations exercises. (I could never listen to balladeers sing of my battle against Bakan without feeling the urge to laugh out loud. They called him an asura and invested him with all kinds of magical powers... but the battle itself was merely a matter of killing someone who needed it – a quick, clean kill with nothing to recommend it in terms of strategy and tactics.) Towards the end of the story, his mother Kunti even tells him about the human men who fathered her sons. What this approach does is to flesh out the quotidian aspects of the great epic, making it more relevant to readers who don’t think of mythology as literal truth (and who aren’t very interested in its religious significance) but read it for what it tells us about human beings and their conflicts, about the everyday bustle of life. But it would be a mistake to think of Bhimsen as a radical, new-fangled attempt to “modernise” or “deconstruct” the Mahabharata. In fact, it draws on the earliest forms of the epic poem – notably the much shorter text called the “Jaya”, which we know about largely through references in other ancient literature, such as Bhasa’s plays, written around the 3rd century AD. In the afterword to Randaamoozham, Nair wrote that he stayed philosophically anchored to this “original version” throughout. This is not to say that a minimalist Mahabharata is intrinsically more worthy or valid than the grander, more fantastical one that most readers are familiar with. Both have their uses and both have something to tell us about the long, fascinating process by which myths are generated and regenerated over time. But at a time when religious fundamentalism has become almost fashionable, when some people take chauvinistic pride in the idea that a sacred text has existed in exactly the same form for thousands of years, it’s important not to forget how old stories grow and change over time. After all, Randaamoozham is also a reminder that the particulars of myths vary as you travel from one part of this vast country to another. “MT brought to his narrative a Kerala-centric appreciation of interpersonal relationships within a rigidly hierarchical family structure, such as that of the Nair tharavad where the pre-eminence of the eldest male is the guiding rule,” says Panicker. This informs the relationship between Yudhisthira and the other Pandava brothers. In her excellent book The Hindus: An Alternative History, the Sanskrit scholar Wendy Doniger explores the vitality of Hinduism and the fact that its major texts have been subject to reinterpretation over the centuries, not set in stone. There is no better example of this than the Mahabharata, and Bhimsen is a worthy addition to the ever-growing canon of this dynamic epic – as well as a fine tribute to a modern classic of regional literature. The complete text of Bhimsen is available here. Have you had a chance to read The Sauptikaparvan by W J Johnson? Do read that. Mayank: no, I haven't. Just looked it up online, seems like something I'd very much want to read. Thanks for the reco. Can you please post a link to this pdf of Bhimsen that you talk about? I looked for it on Smoke Signals - I didn't seem to find it. Oh, sorry, I got it - I hadn't noticed the link at the end (which, btw, needs to be modified a bit). scritic: thanks - I've modified the link. A Stupid Doubt: Does translating books on blog have copyright issues? Paresh: I don't think there's any problem if the blogger has acknowledged the source. On the other hand, if the blogger were to make the text available for download at a price, there might be an issue. E Pradeep: I know, the one titled Second Turn. Haven't been able to get my hands on it yet, but based on what I've heard, it sounds like an awkwardly done sentence-by-sentence translation. Have you read it? i remember reading Second Turn while in college. dont recollect the details about it or the quality of the translation, but the story itself had left quite an impression. definitely found it more deeper than Yajnaseni, though strictly speaking you cant compare the two. Have read the original malayalam version as a teenager. It left an indelible impression on me.. looks like time to catch this one.. There was a saying MT Vasudevan Nair can write only about 'crumbling Nair families' in Kerala. Then MT wrote RANDAMOOZHAM. I remembered how we waited for MATHRUBHUMI weekly which serialized the novel in the 80s. The techniques he used to create BHEEMA in RANDAMOOZHAM was later used in his screenplays. CHANDU from his screenplay ORU VADAKKAN VEERAGADHA (http://en.wikipedia.org/wiki/Oru_Vadakkan_Veeragatha) can be traced BHEEMA of RANDAMOOZHAM. Paresh: I don't think there's any problem if the blogger has acknowledged the source. Panicker explicitly mentions your permission before quoting an email conversation, but there is no mention of any such permission from MT or his publishers, whose work forms the basis of this current work. Then hiding under the disclaimer that this is a transcreation and not a translation is plain intellectual dishonesty. Last Anon: I'm not sure how you can draw equivalence between taking permission for quoting an email conversation (which happened privately, between two individuals) and permission for working with a text that's in the public domain (and which has been fully acknowledged by the transcreator over several posts). It isn't a straight translation, as anyone who's read both works will tell you. No intellectual dishonesty here. theidiot: it often happens that when you first read texts like these (where the concept is an inherently interesting one, or the perspective is new), you tend to get swept along by the storytelling and the perspective, without attaching much importance to the actual quality of the translation. I remember when I first read the English Yagnaseni I could barely put it down; it was only on revisiting it that I could see how awkward (and in some cases even impenetrable) the writing was. (b) Panicker's version is a creative translation so even if someone did take him to court (the author or his estate), the court will still deem it an original work, I think, and characterize its use of the original source material as "fair use". scritic: yes, I didn't mean "public" domain" in the context of copyright. And thanks for the link - that Simpsons incident is mind-boggling. Copyrighted or not .. I dont give a damn.. such a wonderful piece of writing it is.. I miss those weekly updates of Bhimsen on Prem's blog..
Have you chanced upon S L Bhyrappa's Kannada opus called Parva. Bhyrappa has been a controversial figure in Kannada literary circles - famously for his feud with Ananthamurthy. His version brought out by the Sahitya Akademi, shows up all shades of gray and without reference to the supernatural. Do you know if Yugandhar is available in English. A Hindi version of the original Marathi novel is available. But I'd like to find an English version if possible. Incidentally, MT is scripting a movie based on Randamoozham now..Not sure how the complexities of the novel will emerge on the screen but with MT at the helm, it should definitely be worth waiting for.. I agree with Jai about Second Turn. Got hold of a second hand copy and it was extremely literal and the prose stilted. Prem's may be a transcreation but I think it conveys the tone of the original. I have also asked my Dad who has read the original to read Bhimsen. When the verdict is in, I'll get back to you. So far, he thinks it is very good. And about intellectual dishonesty: Prem's work has been a rebirth of sorts for Randamoozham. 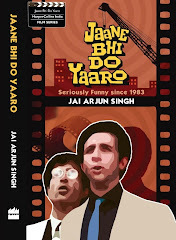 The interest in the book and the movie with the screenplay by MTV himself is at a fever pitch right now. Prem made this classic accessible to a generation of fraud mallus like myself who can't read the language but are steeped in the culture. Would be great to read the email conversation you had with Prem. You mention in this piece that you would post it later. But, I think it slipped your mind to share it later.